The U.S. Food and Drug Administration (FDA) granted Breakthrough Therapy Designation for tezepelumab in patients with severe asthma without an eosinophilic phenotype, announced Amgen and AstraZeneca Pharmaceuticals. Tezepelumab is a potential first-in-class drug that blocks thymic stromal lymphopoietin (TSLP), an upstream modulator of multiple inflammatory pathways, according to Amgen. Blocking TSLP may prevent the release of pro-inflammatory cytokines by immune cells, resulting in the prevention of asthma exacerbations and its improved control. A Breakthrough Therapy Designation is designed to expedite the development and regulatory review of medicines that are intended to treat a serious condition and that have shown encouraging early clinical results which may demonstrate substantial improvement on a clinically significant endpoint over available medicines. Tezepelumab bagged the Breakthrough Therapy Designation backed up by the Phase 2b PATHWAY data. The trial showed a significant reduction in the annual asthma exacerbation rate compared with placebo in a broad population of severe asthma patients independent of baseline blood eosinophil count or other types 2 (T2) inflammatory biomarkers. Currently available biologic therapies only target T2 driven inflammation. Overall, the data showed that annual asthma exacerbation rates were reduced by 62%, 71%, and 66% in the tezepelumab arms administered either 70 mg or 210 mg every 4 weeks or 280 mg every 2 weeks compared with a placebo, respectively.The most common adverse effects reported in the trial were nasopharyngitis, headaches, and bronchitis. 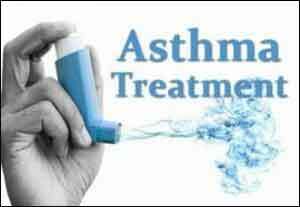 Asthma affects 334 million people worldwide, and up to 10 per cent have severe disease, which may be uncontrolled despite high doses of standard-of-care medicines and can require the use of chronic oral corticosteroids (OCS). Severe uncontrolled asthma is debilitating in patients experiencing frequent exacerbations and significant limitations on lung function.